That sound can send shivers up the spine of women everywhere who struggle with keeping their homes clean. But look here’s the facts: there is a difference between a big major clean and scrub down of your home and a home that just has the appearance of a clean and tidy. Mosts people who are going to come to your house aren’t going to be doing the white glove test. Far from it. They’re there to socialize and visit with you, not assess the cleanliness of your home. 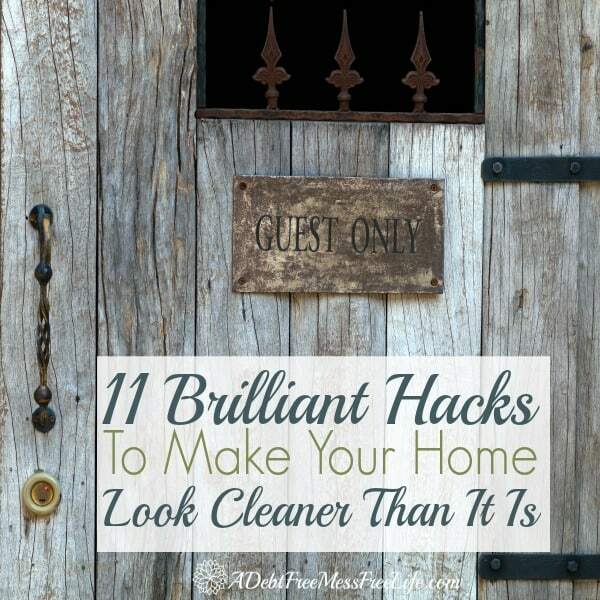 So don’t let your heart skip a beat the next time the doorbell rings, these 11 tricks will save the day and always have your home look cleaner than it is! More than likely no one is heading upstairs to the bedrooms so why waste time cleaning them? Start with the way in which people will enter your home and then follow the natural flow of your house to the room(s) you’ll be using the most. For example, people enter my home one of two ways: either through the mud room up the stairs and directly into the kitchen or in the front door into the dining room and to the kitchen. As a family, we make sure the kitchen, guest bath, and family room are always neat and tidy because we know that where people will congregate. No one spends much time in the dining room, so it takes care of itself. Following this simple piece of advice will make your home look cleaner because you’ll be spending most of your time cleaning these areas and not wasting time on places people won’t see. If the dishwasher is empty, get everyone on board with putting dishes directly into the washer and not into the sink. Take trash out nightly, so it doesn’t stink up the house and put clothes in the hamper at the end of the day. By doing these simple tasks, your home will look cleaner. I always have a candle out somewhere in the house. If it’s not already burning (I like to light a candle every day or use my essential oil diffuser) I burn it as soon as the doorbell rings. This way my home smells good too. Televisions, tabletops, and toilets. If you have very limited time, make sure to keep the dust and grime off these three surfaces. Maintain the toilet bowl by putting in a bleach tablet or other self-cleaning product. It does work at keeping the bowl sparkling fresh. Remove clutter from surfaces to give the appearance of tidiness. We have a little rule in our house that we try to follow. We don’t use the guest bathroom unless necessary. This way that bathroom is always in really excellent condition and ready for guests. If you can’t do this, use one paper towel or rag to quick wipe the mirrors, the faucet, the inside of the sink, and finally the toilet seat — in that order. Close all drawers and cabinets and shut the shower curtain. Flush the toilet and you’re are done. Regularly switch out the old stale dish and hand towels with fresh ones. Nothing is worse for a guest than to dry their hands on a dirty hand towel. If your house is anything like mine, you probably have an issue with pet hair. Here’s how to handle it quickly: Use a lint brush, rubber gloves or if you have the time the vacuum to pick up pet hair on chairs and cushions. I keep a lint roller handy in my kitchen cabinet to be able to do this regularly between weekly vacuums. If it’s during the day and it’s nice outside, open the windows and let the fresh air in. If it’s at night, turn off harsh overhead lights and use table lamps to create a mood. Low lighting makes your home feel cozier and hides all the little imperfections. It’s great at hiding the dirt too. Keep clutter to a minimum in those go to rooms guests will visit by regularly purging items you no longer want or need. If the doorbell rings and you’re not prepared, grab a laundry basket, throw it all in and hide it in a room behind a closed door. Vow to take care of it after guests leave. Most of what makes a floor dirty comes from what we bring inside from the outside. Tackle that by having two door mats – one outside and one inside. Also, get your family in the habit of taking off their shoes when entering the house by keeping a basket at the door. Get rid of those stack of magazines and newspapers, toys, and anything else that is cluttering up the floor. A cleared floor gives the illusion of a bigger space, plus all that clutter is unnecessary. Don’t be afraid the next time the doorbell rings. 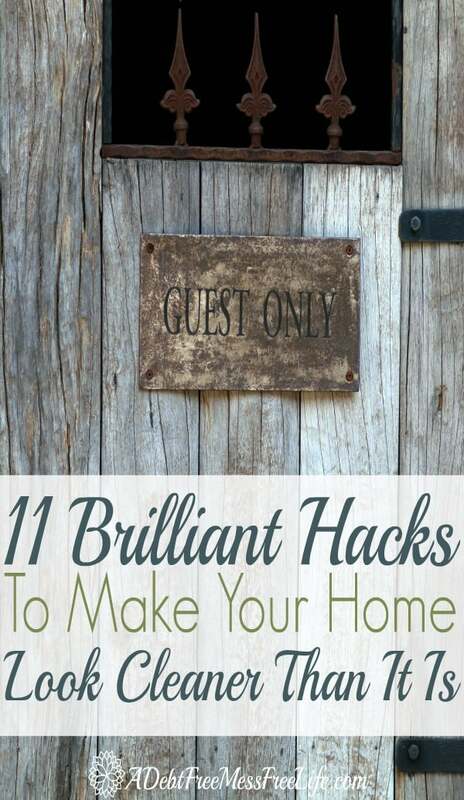 Use these fantastic tricks to make your home appear cleaner than it is and your guests will be none the wiser!